Each year, U.S. universities churn out enough new PhD graduates–50,000 of them–to populate a small city. Worldwide, more PhDs are produced now than ever before. With anecdotes about out-of-work or underemployed PhDs receiving broad publicity, governments and university administrators in industrialized societies have started asking whether or not too many people are pursuing doctoral degrees. 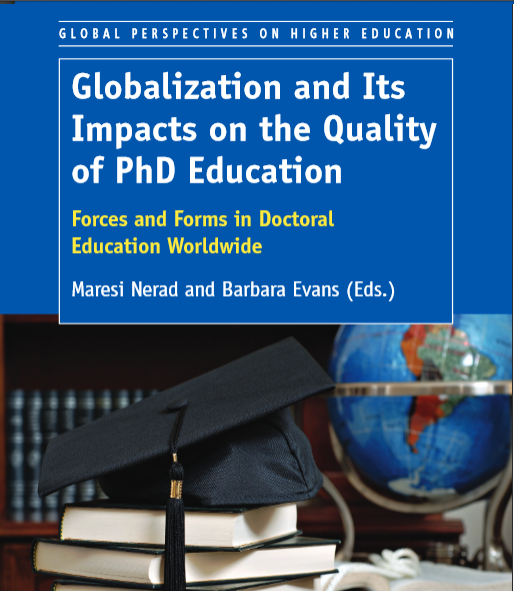 In the new book, Nerad and other experts in doctoral education from around the world delve into the most significant trends that are affecting doctoral education in 15 different countries. The UW professor notes that a possible overproduction of Ph.D. holders is a phenomenon that has different aspects in different parts of the world. “For instance, a number of developing countries are still in need of increasing significantly their Ph.D. holder rate, such as China, India, South Africa and most of the Latin American countries, while highly industrialized societies may experience certain saturation in their academic labor market, and Ph.D. are employed outside academia in industry, government and the non-profit sectors,” Nerad said. Germany, for example, has a tradition that only few PhDs remain in universities (currently 9% of all PhDs), the majority work is in a wide variety of jobs. A limited academic job market exists in countries with a significant drop in birth rates and where national ministries therefore curtail the number of professorial positions, such as Japan. In the USA, we experience a limited academic market in the social sciences and humanities. Nerad says that the debate regarding whether there are too many or too few Ph.D. holders being produced should first answer whether those individuals have received a high quality doctoral education that is accepted worldwide. A second critical question, she says, is whether doctoral education includes the acquisition of professional competencies and experiences to work with colleagues in different settings and with different disciplinary and cultural backgrounds. “In light of the massive increase of PhD production worldwide an emphasis on the quality of doctoral education in different national settings is vital,” Nerad said. 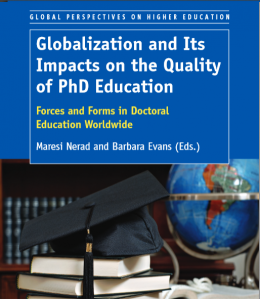 Learn more about what Nerad and her collaborators share in “Globalization and Its Impacts on the Quality of PhD Education” in the following interview. What have you learned about the impact of globalization on Ph.D. education? Nerad: The first major change is the scale of the doctoral education worldwide. What was once a small number of research disciplines has now grown to almost 80 fields in which research doctorates are awarded. What was once a small group of privileged apprentices in elite universities has been replaced by tens of thousands of doctoral students from diverse background in hundreds of universities. Research doctorates are increasingly offered by institutions all over the world, not just in Europe and North America. In our research, we examined policy statements in Europe, Asia, Africa, Australia and North and South America, and were surprised to find three broad commonalities expected of research doctoral programs. First, a Ph.D. should contribute to original work. Second, Ph.D. holders should have substantial knowledge in their area of specialties. Third, there is increasing agreement that Ph.D. training should include development of transferable skills and competencies, referred to as professional development. The agreement worldwide on the need for professional development represents one of the most important effects of globalization on the quality of Ph.D. education. The idea behind these skills is that impactful teaching, effective team-work, convincing presentation of complex contents, grant writing, managing people and budgets, working in multi-disciplinary teams and leadership skills are to be transferred from academic to professional settings. These skills enhance graduates’ employability, their ability to manage their own careers, and their sense of responsibility for making contributions to society. A greater number of people are receiving Ph.D. degrees than ever before. What is the role of these early career researchers in the discussion on quality of doctoral education? Nerad: Today’s doctoral students are globally savvy. Students from one country interact with students from numerous other countries, both in everyday lived reality (on campus, in the classroom, or in laboratory settings) and in virtual reality (via Internet-based communications, or in connection with international collaborative research projects). They demonstrate the prevalence of two sets of distinct interests and behaviors. On the one hand, strong social and environmental awareness and interests, and on the other hand, they act as consumers in relation to doctoral education. Today’s early career researchers want to undertake socially relevant research and do so by creating new knowledge in a problem-based or inquiry-based mode of knowledge production, rather than a solely theory-driven mode. They also behave as consumers picking and choosing a doctoral program that fits their interests and expectations, even if this leads them outside their home country. They approach doctoral study ready to make universities and departments work for them. They urge for a process of cooperative negotiation and agreements between doctoral students and their programs. How much relevance have national governments given to the discussion of quality in doctoral education? Nerad: It is important to understand that the discussion about Ph.D. quality emerges in a context where research training is seen as a means for increasing innovation capacity and competitiveness among societies. Increasingly, more national governments have enforced mechanisms that guarantee efficiency, effectiveness and quality assurance. On the one hand, governments grant more autonomy to their universities and delegate quality assessment tasks to independent accreditation agencies, on the other hand supra-national organizations increasingly develop overarching policies and reform standards. Some assessment tasks move up from the national to the supra-national level, some move down to the institutional level, and some move out to independent quality assurance agencies. Is there any quality assurance model that is more accepted to measure the quality of doctoral education? Nerad: Well, the classic input-throughput-output model from the business world has gained acceptance to the sphere of doctoral education in many countries. This means that the Ph.D. is conceptualized as a productive process that has inputs. These are the students, professors, research infrastructure and political context. After students have been admitted, they proceed through a phase of “throughput” when they are advised/supervised, take courses, participate in professional activities, and undertake research training. The outputs are the completed research projects in form of a dissertation or a number of peer-reviewed publications, and the production of a scholar per se. Increasingly countries include placement information and satisfaction of their Ph.Ds holders as quality criteria. In the U.S. we more and more try to assess the impact Ph.Ds have in society as a quality measure. What are the effects of this standardized model on the doctoral education systems? Nerad: The standardized quality assurance model has had a set of positive effects. It has created not only a more uniform but also a more transparent system of quality assurance, and these factors in turn have given researchers more mobility. It is easier for doctoral candidates to study and work at foreign universities, and they have more opportunities for employment outside their home countries after graduation. But, it has also brought a number of dynamic tensions. For example, a national government that has invested in a national labor force wants its doctorate-holding citizens to return or remain at home. As education at the doctoral level is very expensive, it is heavily subsidized in the U.S. and elsewhere through research grants and fellowships. The dynamic tension between individual interests and national agendas will continue to emerge periodically as an issue for discussion. Another common tension is the goal of opening higher education and doctoral education to all citizens and creating a diverse student body can quickly find itself in conflict with meeting immediate financial needs or earning world-class rankings. A university facing reduced governmental contributions faces the temptation to admit more highly qualified international doctoral candidates who can pay substantially higher fees instead of admitting a local candidate from a historically underrepresented group who may need financial assistance in order to pursue his or her doctorate. An additional challenge emerges between efficiency and inducing innovation. The goal to educate doctoral students to be creative and innovative—with all the false starts and learning from experience that entails—is in conflict with the goal for doctoral students to be completed within a standard period of time, often the shortest time possible. These types of discussions are happening across graduate schools, deans and program chairs in European, Asian and North American universities frequently. A further tension is the greater financial support and higher status of doctoral programs in STEM and related disciplines and subsequently greater influence within their institutions by comparison with doctoral programs in the humanities, the arts and the social sciences (except business administration), which seem to be losing resources as well as institutional status. If these tensions are so common, are universities taking any actions to achieve agreement on how to measure the quality of doctoral education? Nerad: Well, the glass that may look half-empty begins to look half-full when we notice that more and more universities and organizations representing universities are working proactively to find solutions. The United States, once the sole leader in flexible, bottom-up quality-management schemes, now shares that leadership with other countries such as Australia and New Zealand. In addition, organizations like the European University Association’s Council for Doctoral Education are urging the passage of legislation that will allow doctoral education to be evaluated and rewarded not only for its output numbers and rankings but also for its provision of dynamic, diverse research contexts and high-quality supervision. The hope is that the newly intensified and competitive international research context, along with an increased national focus on the role of doctoral education in building the knowledge economy, will produce a new generation of Ph.D. graduates who are especially committed to and capable of defining and solving urgent societal problems at home.